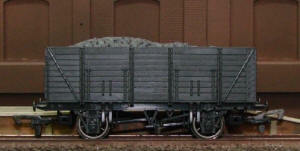 Dapol GWR Gunpowder Wagon. Gunpowder vans were especially constructed vans designed for the safer transport of gunpowder and other potentially explosive substances. In the 1920�s the RCH laid down rules and standards governing the running and construction of these vans and these rules were enforced relatively unchanged until the early 1980�s when gunpowder vans were decommissioned. The vans were often painted in distinguishing colours or with crosses to identify the wagons and the potential dangers. 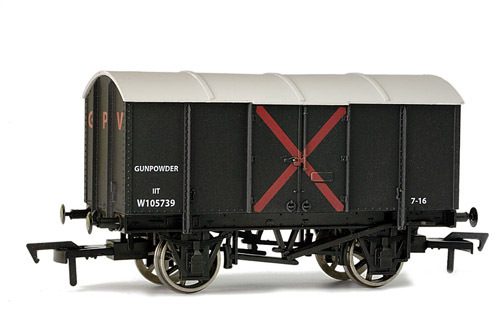 The Dapol model the gunpowder van features: � Highly detailed body moulding, � Profiled wheels, � NEM pockets with self centring couplings, � Accurately applied livery. 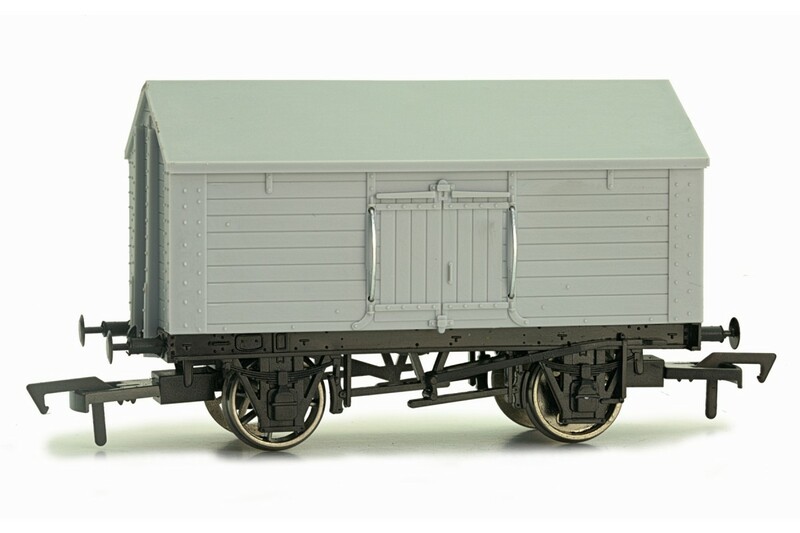 The Dapol model of the cattle van is based on the GWR design, of which over 1300 were built and features: � Highly detailed body moulding, � Profiled wheels, � NEM pockets with self centring couplings, � Accurately applied livery. 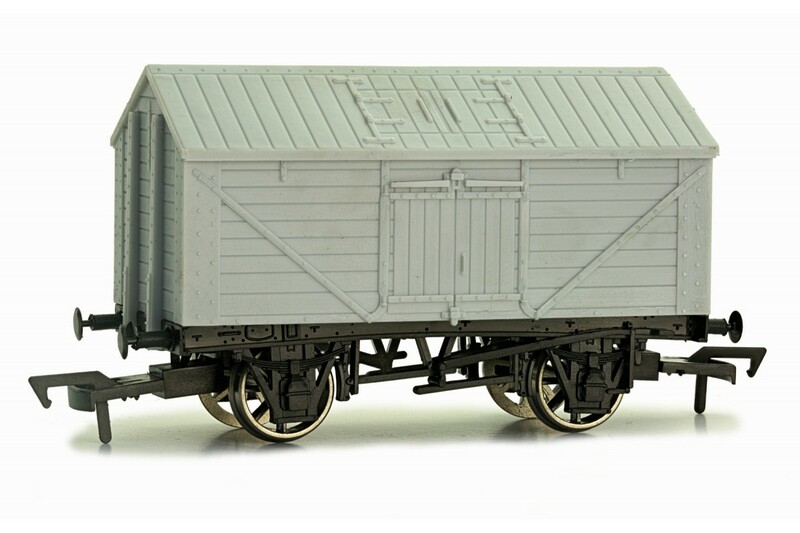 The Dapol model of the cattle van is based on the GWR design, of which over 1300 were built and features: � Highly detailed body moulding, � Profiled wheels, � NEM pockets with self centring couplings, � Accurately applied livery, � Weathered finish. 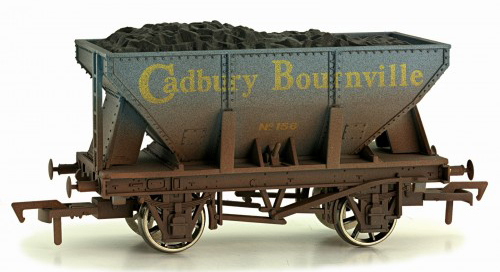 Dapol 21t Hopper Cadbury Bournville 56. Dapol 4 Plank Wagon Cadbury Weathered. Dapol 4 Plank Wagon GWR 45506 with timber load. The 4 Plank Wagon was built by the GWR in the early 1900�s.to determine which design would make the best general purpose open wagon. 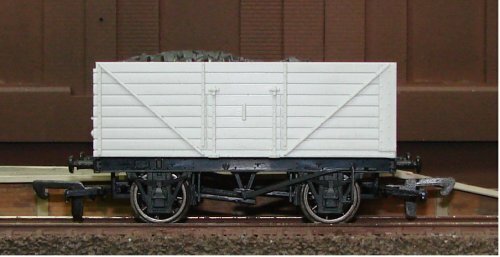 200 wagons were built, however the design was not considered a success and was superseded by the later built 5 plank wagon which proved more versatile. The 7 plank wagon was the standard coal wagon up to the 1930�s when steel mineral wagons were developed. Dapol Model two variations of 7 plank wagon, the internally braced variant with a 9 foot chassis with no end doors and a 10 ton capacity and the RCH standard with a 10 foot chassis and 12 ton capacity. Both Models Feature: Highly detailed body moulding, Complete with load, Profiled wheels, NEM pockets with self centring couplings, Accurately applied livery. Dapol 5 Plank Wagon 9' ICI Billingham Division Weathered. 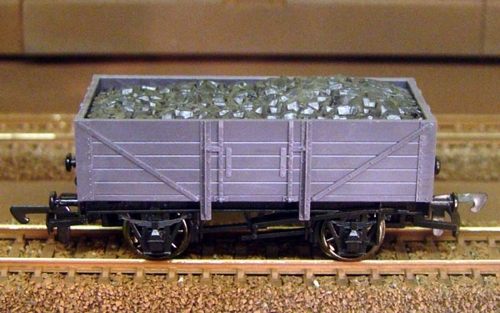 Dapol GWR Bulk Grain Wagon (weathered). Dapol 00 - Unpainted 5 plank wagon. 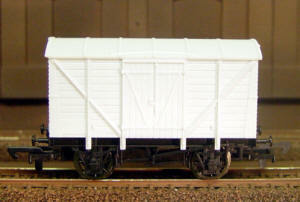 Dapol 00 - Unpainted 7 plank wagon. 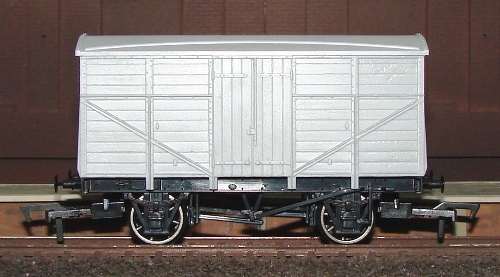 Dapol 00 - Unpainted 21T Hopper wagon. Dapol 00 - Unpainted vent van. 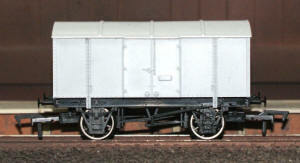 Dapol 00 - Unpainted 4 plank wagon. Dapol 00 - Unpainted 8 plank wagon. Dapol 00 - Unpainted 9 plank wagon. 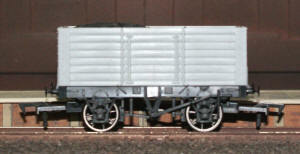 Dapol 00 - Unpainted 16T Mineral wagon. Dapol 00 - Unpainted 20T Mineral wagon. Dapol 00 - Unpainted Cattle wagon. 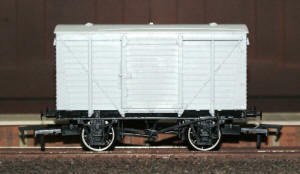 Dapol 00 - Unpainted Fruit Van wagon. 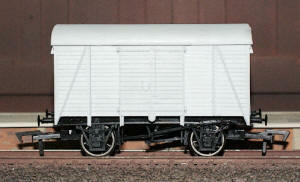 Dapol 00 - Unpainted Box Van wagon. 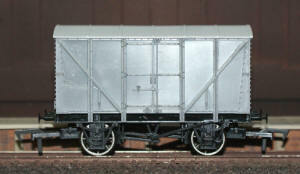 Dapol 00 - Unpainted Fruit D wagon. 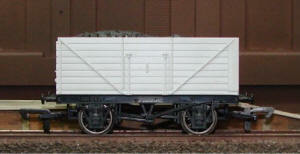 Dapol 00 - Unpainted 7 Plank 9' wagon. 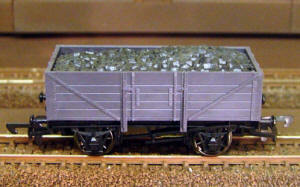 Dapol 00 - Unpainted 5 Plank 9' wagon. 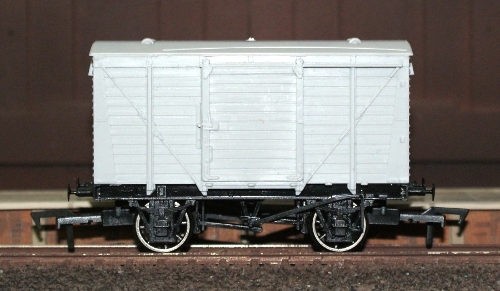 Dapol 00 - Unpainted Gunpowder Van wagon. Dapol 00 - Unpainted Banana Van wagon. 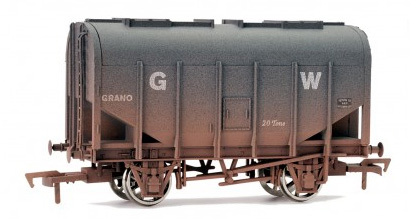 Dapol 00 - Unpainted Grampus wagon. 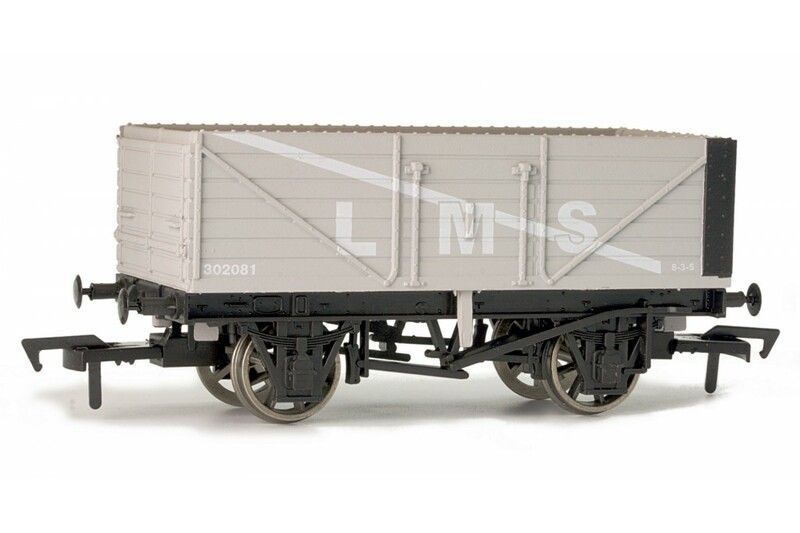 Dapol 00 - Unpainted LMS Vent Van wagon. Dapol 00 - Unpainted Salt Van. Dapol 00 - Unpainted Lime Wagon. 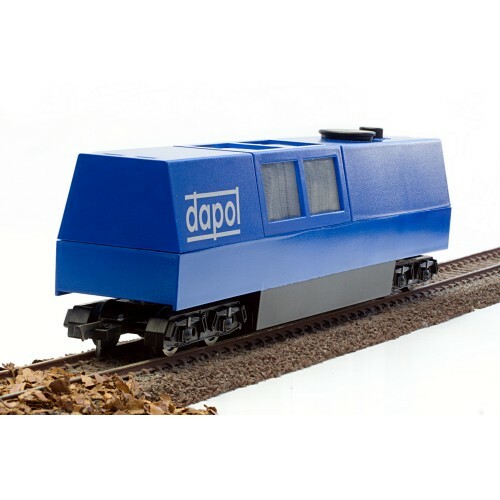 Dapol HO/OO Gauge DCC Ready 5 Way Track Cleaner. 5 way refers to, liquid application, sprung polishing, abrasive scraping, brushing and vacuuming. 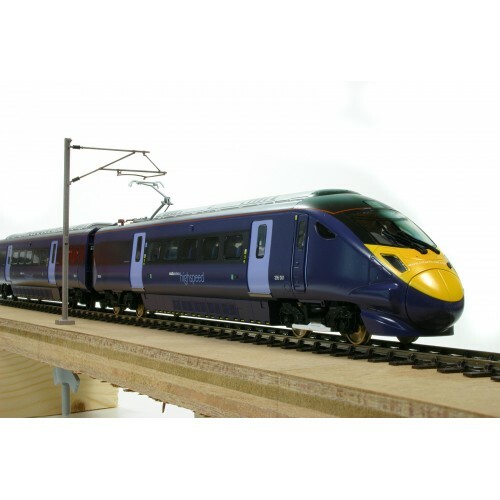 This model uses the latest in technology to aid you keeping your track clean and is perfect for those hard to reach places such as tunnels, at the back of layouts or under catenary wires. It is DCC ready and features an 8pin DCC socket that can take either UK or USA configured decoders (orientated), and needs a chip that can operate the motor to function on DCC. It can be run on DC as a normal item with the motor sharing power with the locomotive that is needed to haul it. There is an onboard on/off switch to aid this. The motor within the unit powers, at the modellers choice, either the vacuum function or the sprung abrasive/polishing head. There is also an under body brush for basic removal of dirt/fluff etc, and a reservoir that can be filled with any non flammable, plastic friendly track cleaning solution that feeds down onto a sponge (included) that rubs the rail head (to be used before the sprung buffing head). It is fitted with the best of darkened profile wheels set to a 14.4mm back to back and to RP25.110 standards, and is fitted with standard UK type couplings within an NEM coupling box. 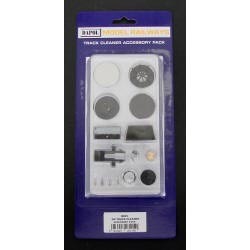 Dapol Track Cleaner Accessory Pack. 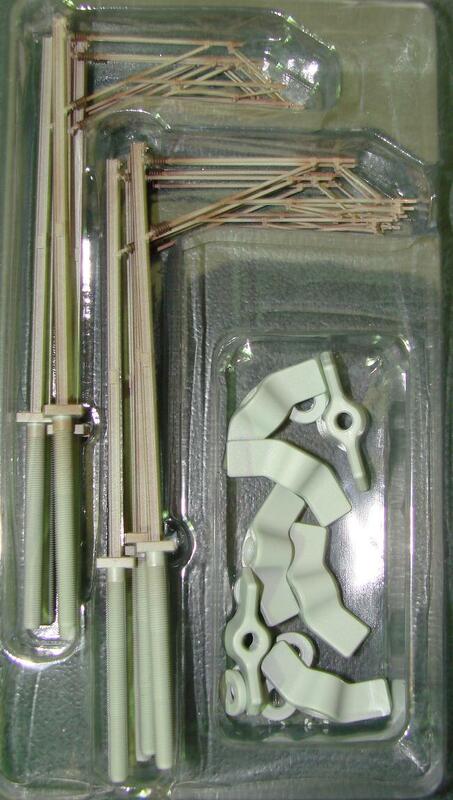 Dapol Track Cleaner Accessory Pack. This kit contains spare pads, pick ups, brushes, seals, weights and other accessories for the Dapol OO/HO Gauge Track cleaner. 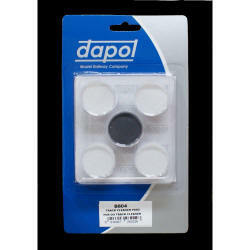 Replacement Dapol track cleaner pads. Dapol track cleaning fluid has been especially formulated to clean track quickly, safely and efficiently. It is a non-aqueous mixture of high purity hydrocarbons and can be used manually or the Tomix or Dapol Track Cleaning cars. It will not damage plastics, and will help clean and maintain track in peak condition. Dapol do not recommend IPA, alcohol or other solvents as these are hazardous in operation and contain traces of water which may impair performance with long term use. Dapol Railway 15T Diesel Crane. 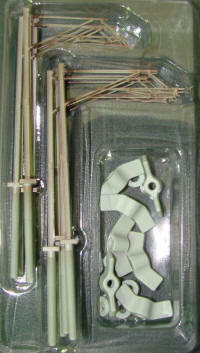 Plastic Kit requires assembly and painting. Paints & Glue not included. Click here to view Humbrol Paints, Brushes & Glues. 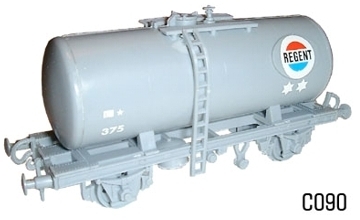 Dapol Railway 20T Tanker BP. Two classes of vehicle were built, Class A for carrying petrol and highly inflammable products and Class B for carrying fuel oils, diesel oils and kerosene�s. The Class B type barrel is fitted with steam coils to assist the off-loading of heavy fuel oils. Discharge of the load is controlled by internal rod and plug, operated by the hand wheel located at the top of the tank barrel. Dapol Railway 20T Tanker Esso. Dapol Railway 16T Mineral Wagon. 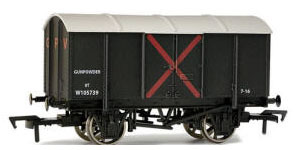 The standard 16-ton mineral wagon was used in great numbers by British Railways in both fitted and unfitted (that is with vacuum brakes,) forms. 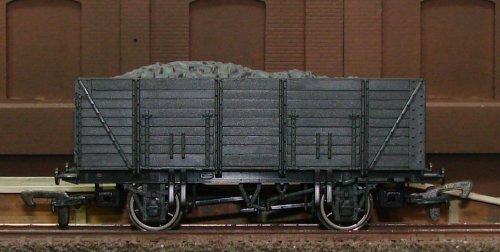 These all-steel wagons had largely replaced the earlier wooden planked wagons for the transport of coal and other minerals. Dapol Railway BR Brake Van. The 20-ton goods brake van was first introduced in 1951, and is based upon the earlier L.N.E.R. vehicle. Production was commenced by the North Eastern Region of British Railways, and many hundreds were brought into service. The brake van has a steel under frame and timber body, fitted with seats, lockers and a stove for the guard, in addition to the screw brake hand wheel and vacuum brake application gear. The body features projecting side windows for all round visibility. Plain journals running in fabricated steel axle boxes with 3ft 2in-diameter disc wheels. Fitted vacuum brake with one 18in cylinder operating two brake blocks to each wheel, with an additional screw hand brake operated from inside the body. Technical Data: Length over buffers 27ft, Inside body length 10ft, Overall height, including chimney 12ft, 2in, Wheel base 16ft. 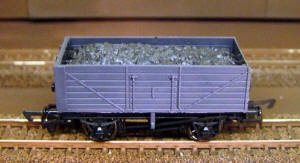 Dapol Railway BR Cattle Wagon. 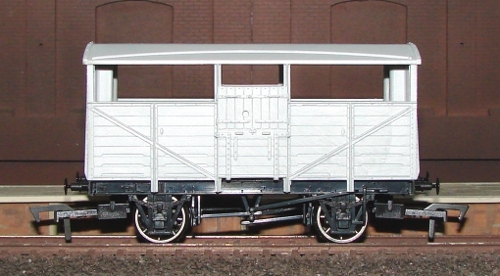 The cattle wagon has figured as an item of railway rolling stock since the very early days of railways, and the British Railways standard cattle wagon featured in this kit is one of the later designs to see service. A vacuum brake with one 0.46cm cylinder operates one brake block to each wheel with an additional handbrake each side for marshalling only. 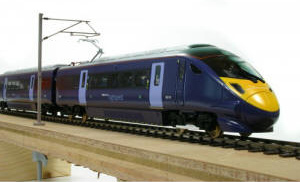 Technical Data: Length over buffers, 6.68m, Inside body length, 3.48m, Wheel-base, 3.35m. 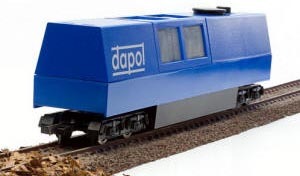 Dapol Railway Pressflo Cement Wagon. Dapol Railway 10T Ventilated Meat Van.The 10-ton ventilated meat van operated by British Railways is a direct development of the vans used by the former L.M.S. Railway. The van makes maximum use of standard components, and its under frame is in fact identical with that used on the 12-ton ventilated goods van. The body differs externally only in the additional ventilators used on the meat van. The maroon colour scheme shows that the vehicle is used for fresh meat and the �XP� code denotes that the van is suitable for running in passenger trains. The vehicle is equipped with hand lever brakes. Dapol Railway 20T Regent Tanker. Plastic Kit requires assembly and painting. Paints & Glue not included. Click here to view Humbrol Paints, Brushes & Glues. 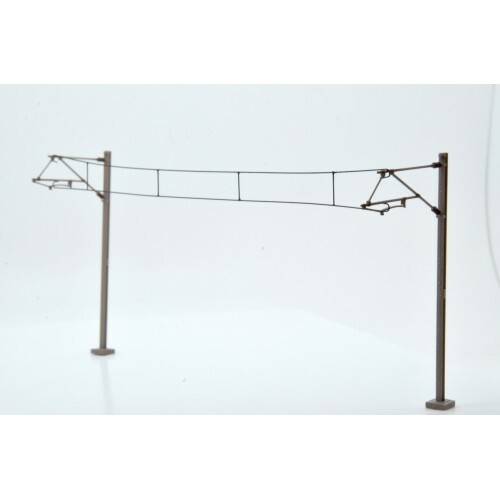 Dapol OO Catenary Mast Pack of 10. 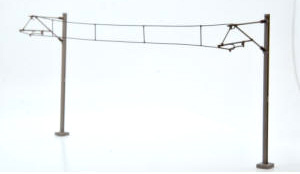 Dapol innovative Easi-Fit Catenary masts are an ideal additon to any OO Gauge layout with an electric theme. They are finely moulded and show all the mast detail, insulators and cables perfectly. They are do easy to fit. Drill a whole and fasten in from the bottom with the supplied wing nut and that's it. OO Gauge Catenary Wires 337 mm Pack of 5. These catenary wires are made from soldered wire les than 0.5mm in diameter. They are designed to simply clip onto our catenary masts and can be further trimmed for a neat appearance.